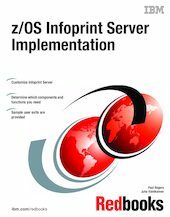 This IBM Redbooks publication describes how to customize the Infoprint Server, an element of z/OS Version 1 Release 1, and Infoprint Server Transforms Version 1 Release 1 Modification Level 1, a separate IBM program product (5697-F51). It is intended for system programmers and administrators responsible for customizing Infoprint Server for their installation. The reader should be familiar with z/OS UNIX System Services, TCP/IP, the Job Entry Subsystem (JES), and z/OS Job Control Language (JCL). In this book we introduce Infoprint Server, describe how the components fit into your system, list the functions each component provides, and identify the components you need to customize in order to use each function. We then describe how to customize each component of Infoprint Server. Sample user exits are provided as an aid in customizing your own exits.